Megan M. Carpenter is dean of the University of New Hampshire School of Law. Dean Carpenter is an internationally known expert in intellectual property, with particular interests in entrepreneurship, branding, and the arts. Prior to joining UNH Law, Dean Carpenter was founder and co-director of the Center for Law and Intellectual Property at Texas A&M University School of Law, where she also served as Professor of Law and Faculty Director of three intellectual property and entrepreneurship-related clinical programs. Dean Carpenter has extensive experience in institution-building; her talent for driving initiatives from concept to execution has helped to establish successful programs across higher education. She has spearheaded the creation of innovative academic programs, including experiential learning initiatives, joint degree programs, study abroad, regular conferences and symposia, certificate programs, and interdisciplinary programs with various colleges across university campuses. A hallmark of her leadership is a collaborative and student-centered approach. She writes and publishes in the area of intellectual property and innovation, including the book, Evolving Economies: The Role of Law in Entrepreneurship and Innovation. 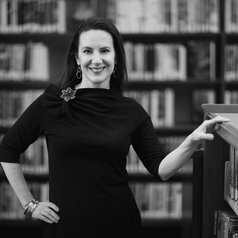 She has written multiple book chapters and published works in the Hastings Law Journal, Fordham Law Review, Columbia Journal of Law & the Arts, Vanderbilt Journal of Entertainment and Technology Law, and the Yale Journal of Human Rights and Development. Dean Carpenter believes that learning best takes place at the intersection of theory, policy, and practice. Throughout her career, Dean Carpenter has engaged intellectual property law with underserved communities such as early-stage entrepreneurs, musicians, and grassroots arts organizations. Dean Carpenter practiced law at Kirkpatrick & Lockhart (now K&L Gates), where she represented clients on a variety of intellectual property and technology-related issues.